As Vigan is known for its historic ancestral houses that illustrate a fusion of architecture from Spanish colonial time with Asian influences, the people of Vigan also exert great effort to preserve the tradition of making “burnay”. Burnay is unglazed earthen jars, an industry that dates back to pre-colonial times when immigrants from China came and settled in Vigan. 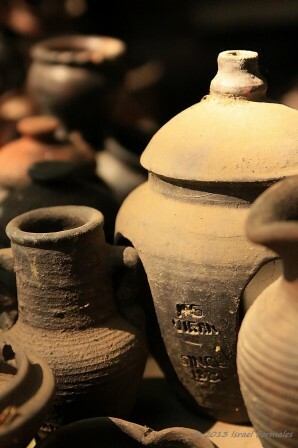 Burnay jars have small openings, and its earlier use were for tea drinking, storage for water, rice grains and as container for salt, brown sugar, local wine (basi) and bagoong (fermented fish). These earthenware jars are crafted by a potter’s skillful hands with a help of potter’s wheel and a kiln. 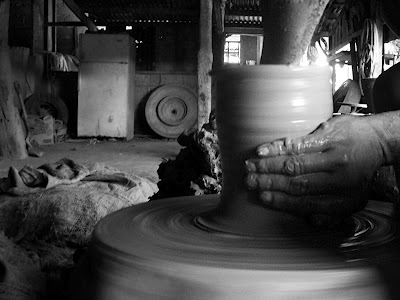 The potter uses a grade A clay that is widely available in the western area of Vigan. Fine sand is used as a tempering material to achieve the desired shape, afterwards, it will be placed inside a high-temperature ground kiln made of brick and clay. Because of this, people say that burnay jars are harder and durable compared to terra cotta. The art and technology of making burnays were brought to Vigan by Chinese artisans. For which, the art of making burnays existed in the area of Vigan right before the Spaniards came in 1572. These Chinese artisans, who built this industry relied on the locals of Vigan for their clay and labor. The industry of making burnays prosper in 1890, when Pedro Go, a Chinese settler from Chinkang, in Fukien, Mainland China set-upped his camarin (jar factory) along what is now known as Rivero Street in Brgy. VIII. Later on around 1916, Ongkai Go, son of Pedro Go’s brother, came to the Philippines and worked with him, however, Ongkai went back to China to get marry when he was 18 years old. Ongkai went back to the Philippines in 1922, and together with his cousin Igan Go, they built their own jar factory known until today as Ruby Pottery. Years later, the son of the late Ongkai, Fidel Go, inherited the factory from Igan Go. Continuing the tradition of the craft inherited and preserving the art of making burnays, Fidel Go was awarded with the Gawad Manlilikha ng Bayan (National Folk Artist Award) of the National Commission on Culture and the Arts in 1990. As of today, there are, three (3) “burnay” factories remain: RG Jar Factory, Ruby Pottery, and NP Jar Factory. These “burnay” factories are the only ones found throughout the country. Nowadays, varieties of burnay jars are made, mostly for decorative purposes. People buy them mostly to serve as decorations inside their homes and gardens. Burnay jars are also sought-after by foreign and local tourists. It has reached the markets abroad, especially in Europe. Foreign and local traders made contact with burnay factory owners to order not only the traditional designs of burnay but as well according to their preferences. Through these continuous demands of earthen jars, it has sustained the livelihood of many Chinese and Fil-Chinese generations who own burnay factories or camarin, and most importantly the preservation of the craft. The art of making burnay stood the test of time and continues to showcase Filipinos artistry and craftsmanship. Highly quality products and preserved tradition: Burnay jars of Vigan, Ilocos Sur. If you’ve enjoyed these bits of information, make sure to subscribe to my mailing list to read the latest blog from The Mixed Culture straight from your inbox. Or, follow me on Facebook or Instagram to know the newest scoop from me. Feel free to email for any questions or comment below.